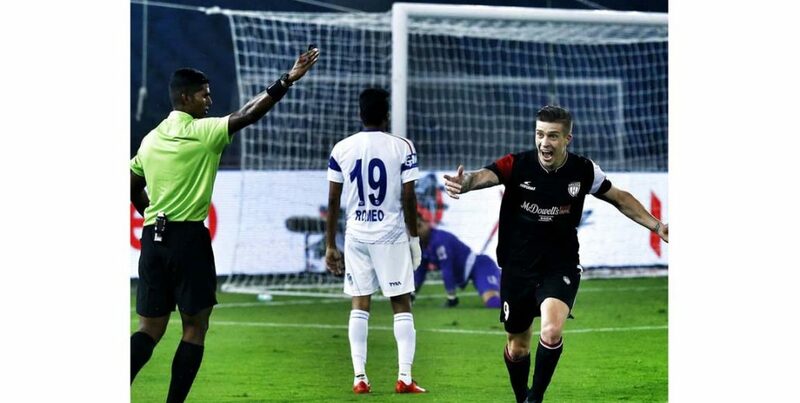 Federico Gallego and Bartholomew Ogbeche with their late strikes helped NorthEast United FC (NEUFC) win the match on Tuesday against Delhi Dynamos 2-0 in the Indian Super League 2018 (ISL) at the Jawaharlal Nehru Stadium in New Delhi. The NEUFC players failed to make any breakthrough until the 82nd but after that the visitors outsmarted the visitors with two goals to nil. This was NEUFC’s third win and the best start they have had to any of their campaigns in Indian Super League. A report published on Tuesday by The Weekend Leader stated NorthEast United spurned a golden chance to take an early lead five minutes into the match. A pacy surge forward by the hosts was led by NEUFC skipper Ogbeche who played a one-two with Redeem Tlang before unleashing a dipping effort from the edge of the box. The goalkeeper stood no chance of keeping it out but luckily for him, the effort hit the crossbar. The NEUFC players were attacking in numbers with Tlang’s exploits on the right flank pinning both Nandhakumar Sekar and Narayan Das into their own half. Lallianzuala Chhangte’s pace was put to the test when an over-hit backpass placed Robert Lalthlamuana in a spot of bother in the visitor’s half. The defender managed to get to the ball before the Mizo-born winger and averted a defensive catastrophe against the run of play. It has been reported that NEUFC had a couple more chances before the break but they failed to make best use of those chances. Accordting to the match report, the first chance that the visitors got after the break saw Gallego’s powerful shot take a deflection off a sliding Gianni Zuiverloon and went straight into the hands of goalkeeper Francisco. The hosts had their chance in the 78th minute when a long ball by Marti Crespi fell perfectly for Kaludjerovic at the edge of the box. The visitors got their goal through a moment of brilliance from Gallego. The Uruguayan midfielder picked up the ball from the left flank, skipped past his marker, surged into the box before sending a stunning finish into the bottom right corner. Romeo Fernandes’ poor pass back to Pritam Kotal was intercepted by Gallego who charged down the left flank and squared the ball to Ogbeche. The Nigerian forward sent the ball into the net to complete NEUFC’s masterclass in the national capital. Capital Punishment for Delhi Dynamos! ? It took us 82 minutes to breakthrough but it was definitely worth the wait! ?